I think Kinesis has been bombarded with every possible request for free beta testing boards, I guess it comes with the territory. Although I don't specifically know how Kinesis is administering the program, often beta testing involves different groups of people testing different aspects. It can be very specialized, as it should be. That's the idea behind test beds. great job argcargv. I tried something similar time ago (I got the apple trackpad just for the mod), but I just didn't like it. I know the advantage of using both hands for moving the cursor, but just couldn't get used to it. I used a base of 2 metallic book stands to get a solid stand for it, and did not glue it to the keyboard. I know, I know... It just looks so functional. BTW, what size of keys did you use for the thumb cluster? kaltar, the single tall thumb key are SA, the other keys DSA, the flat keys are also from signature plastic. My intent wasn't that YOU'RE banging to get a FREE BETA board, I meant that in GENERAL I'm pretty sure peeps either want a free/discounted test board, or access to the beta boards (who wouldn't? )….but I didn't mean to direct anything at you. But I know it would bring about world peace if Kinesis gave out free Advantage keyboards to the typists of the world. How about a beta program where you pay the expected retail price for the final product, with the agreement being that you have to return the beta item at the end for the final product when it comes out? I would love to be a beta tester for this. My wish list is a metal case, backlit keys, no more rubber control keys and full media key support. 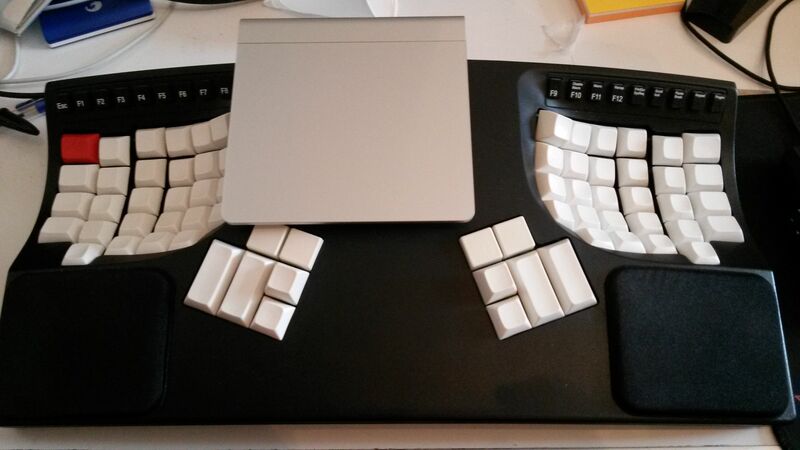 Please kinesis. Contoured split design no more rubber keys full programmability and bluetooth. Other than this I would have a hard time parting with my money. thanks. the top thumb keys look almost unreachable, but looks cool. I can't reach them with my thumb anyways, and I rarely if ever, use them. I've often wondered, more now than ever, if Kinesis is missing the boat by not having a different theory of an "upgraded model". Something much different than the Advantage Pro, which really is no different than an Advantage but looks great with an iMac due to the silver/black motif. What if they made an additional model, a limited run, super-upgraded version of the Contoured Advantage? Granted I did some of these mods and others have done the others, but I'm guessing if they made a highly upgraded model with a very modest price bump, it would be a sales tool to get even more attention and sales interest. Is Maltron getting extra sales thanks to the pink or gold edition? But I'd think it would be a lot more than a color option. Function over form. 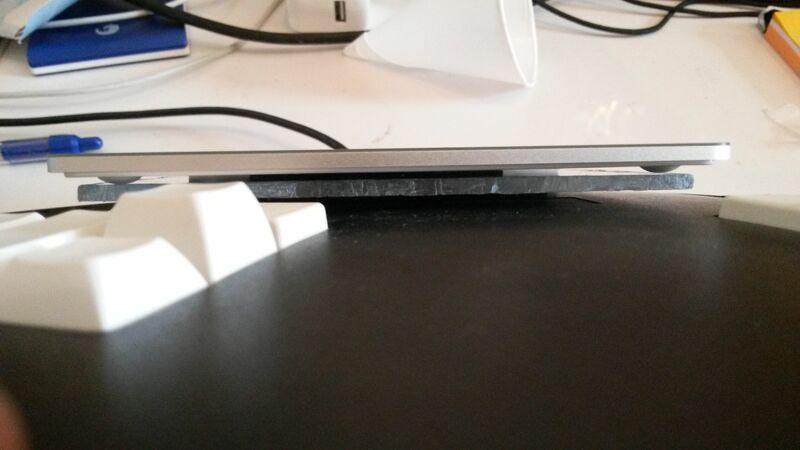 Can you provide some deers about where you got that plastic bit to rest the trackpad on (or if you have an extra left over?)? 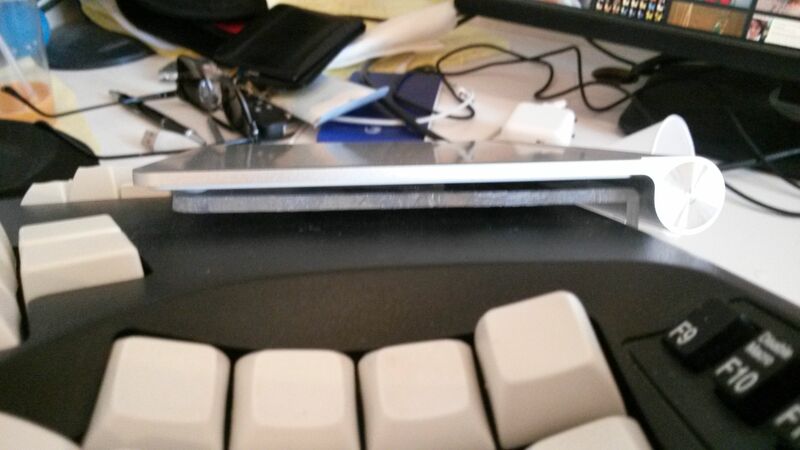 That is exactly the kind of thing I am looking for to mount my trackpad ( I hate tap to click ). I am sure you can find a cheaper piece of plastic that is strong enough to provide a solid foundation. This is something we'd like to do. Revamp the Advantage Pro so that it's not just an upgraded Advantage, but many of the things you stated. BTW, Rubber function rows will be a thing of the past! Any comment on the rest, such as increased tenting angle and more keys? The new Kinesis Advantage needs at least 2 more easily accessible modifier keys: WindowsKey and LayerShift. I hope they heed MY #1 suggestion and paint dat ting BRIGHT RED! Only thing I can comment on is #6. That's a go. Fantastic to hear that things are coming on! Just one more year until we see this new kinesis! I kne, right? I'm my sig, the Split Kinesis article (that's still borked, but I have links to pics thanks to CptBadAss) has a pic of a red board and a black board with red home keys (that's mine). Another vote for LayerShift and better function keys. Oh, man. After reading through this thread I'm excited to see the next gen! I don't have any suggestions that haven't already been posted. Yay, a real FN row! Other than that? 1. A trackball. Please, please, a trackball. 2. Other switch options. MX Clears? 3. PBT keycaps - at least as an option - maybe this could be one of the distinguishing factors between the new Advantage and the new Advantage Pro. Heh, and almost no way to get replacement keycaps? I didn't say it was easy! <joke> but it's totally worth it, the Matias Quiet tactile switches are awesome...tried them at Kiibohd 8 yesterday (as week as the Clicky tactile). Actually Signature Plastics makes the keycaps we need. 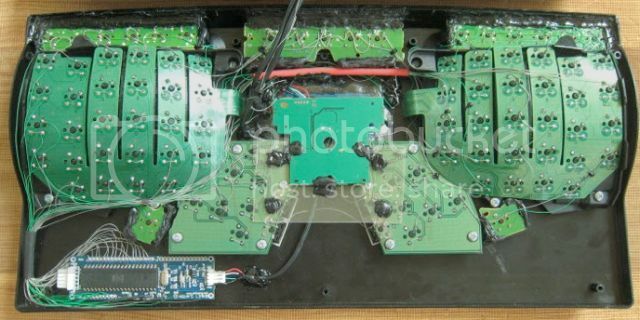 I'm committed to removing the Cherry switches, filing the key wells slightly wider and inserting Matias Quiet Click. At Kiibohd 8 yesterday I measured the openings of Haatas "cross-platform switch plate" that will hold Cherry AND Matias.... wait for it...wait for it...wait........(approx) 15.5mm x 13.9mm (approx) openings will hold either type switch. I think we're more likely to see Perl 7 before we get a new Advantage. Doesn't really matter much at this point...so many advancement via GH are happening, that the resources needed to make almost anything is close to hitting the street. We're just about in "the now". Any news regarding features and release date? here is a picture that i haven't see posted on this topic. Would love to see more pics. No it's someone's personal mod, I think it originated from a Korean website. 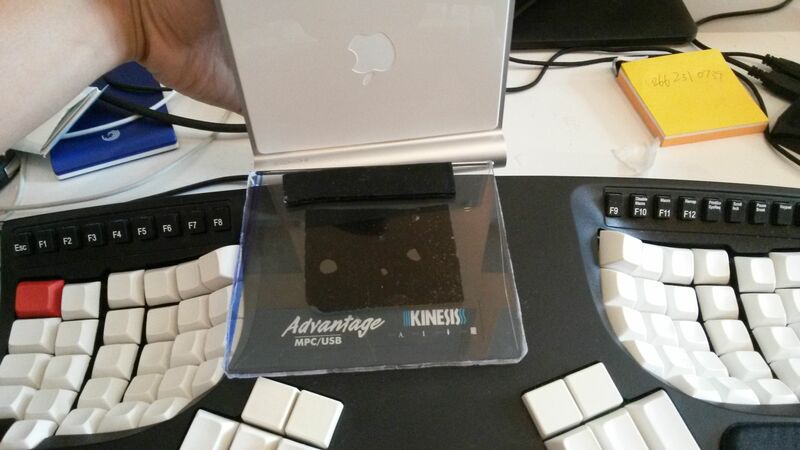 Recent user of Kinesis Advantage due to tendon problem caused by hunt and peck keyboarding for nearly 2 decades. Frantically feeding my mouse / trackball addiction to find the best one, but finding that trackpad for me is the fastest around (in combination with better touch tool). Really liking the above mod. May try that out very soon. Thanks for sharing! natas206, I purchased the Kinesis Advantage Pro a few months ago. Do you think there will be any trade-in programs or discounted price of the new keyboard when it hits the market? I'm not expecting any deal like that, but at the price they cost, it would be a nice offer. 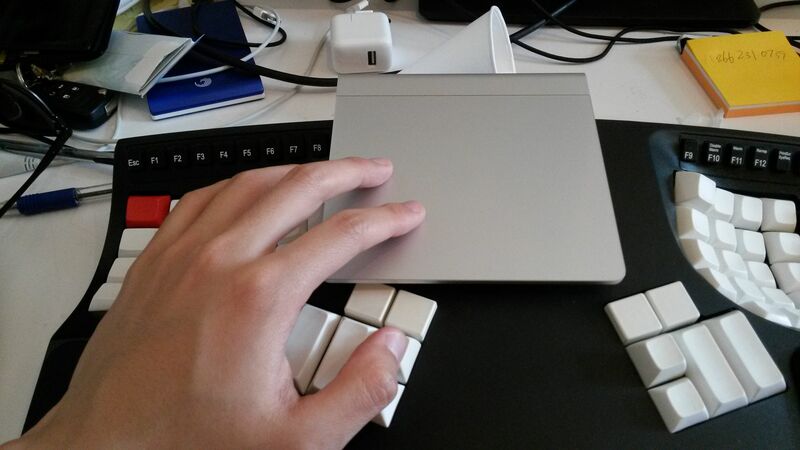 My advantage I've been using for a year with my magic trackpad (clicky!) mount modification to prove my worthiness. I somehow didn’t notice this before. I like the use of the SA keycaps on a few keys. I’m curious about the flat low-profile keycaps though. Seems like those would be nearly impossible to press. Working 2 months a year in Nova Scotia during summer-time (home-base is Ontario) and travelling with the Kinesis Advantage is a bit of a pain, can't really say it is "mobile friendly" Decided to order one for our Nova Scotia summer address. And now I read this post and a bit reluctant to order just yet. Next trip is still half a year away... I can only hope the new Advantage is out before that time. By no means a long term user of the Kinesis Advantage; ± 1.5 years now, however if there's 1 "complaint", it's the finicky rubber Function keys. Reading that those will be a thing of the past really makes me want to wait with buying now. Edit: Reading is such an art... Just read the entire post where there is a mention by Natas206 of possibly a release by early 2015. That would be perfect timing!!! 1. Make macros printable to a text doc so we can see what's stored where. 3. Flip feet on the user edge (palm-edge) of the board. 5. Change the thumb clusters so the tilt is sloped higher at center of board to lower closer to main key-clusters. keys/ \keys instead of the current \keys keys/ slope. I hope that makes sense. They are uncomfortable to me how they currently are. It feels like I'm reaching over the keys to press instead of my thumb moving over to bump the keys which would be much more ergonomic in my opinion. does any beta tester got a sample yet? 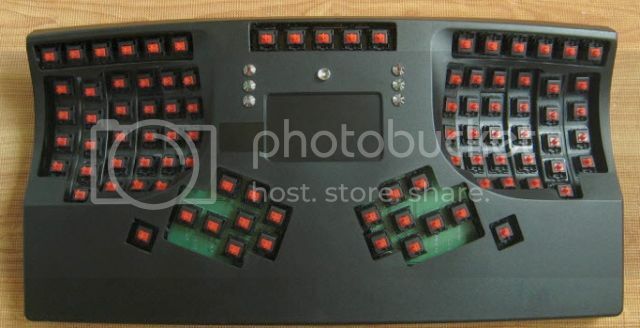 I've just bought the current version of the advantage keyboard but I don't know if I should keep it. The function keys are (sorry) ridiculous and if it's really out in only a few months I'd send the current one back (not a problem with Amazon) and wait for the new version.